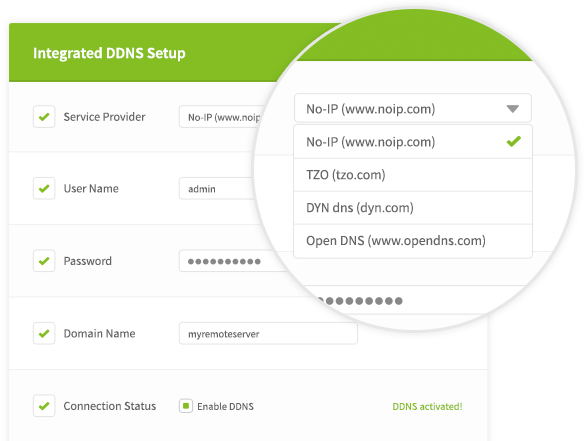 No-IP’s trusted and Free Dynamic DNS solution is the best available option with global accessibility and legendary uptime. Our mission is to provide a useful, reliable & powerful integrated Dynamic DNS service. How? Integrating Dynamic DNS into your device is as easy as a single URL call to our API. Adding our integrated DDNS solution is easy, how easy? Let us show you! Including No-IP's expansive network with over 100 points of presence across the globe as an integrated DDNS solution is a valuable asset to any hardware. Our network is trusted by over 25 million users across the globe. Choose the integrated Dynamic DNS service that helps home users, small and large businesses and even fortune 500 companies take control over all aspects of their dynamic DNS. From the small local business down the street, to the biggest brands in the world, hundreds of companies worldwide rely on our Integrated Dynamic DNS solution for their friends, partners and customers. Your customers want it. It’s the top request! A recent customer survey found that 87% of respondents want No-IP as an integrated dynamic DNS option in their devices. Premium options available - Interested in a Premium Integrated Solution? Email an Integration Specialist today to learn more! Integration is EASY! If you already have DDNS in your device, adding No-IP takes no time at all. Save your customers hundreds of dollars a year by not requiring a static IP for remote access. No-IP is the world’s largest and most trusted free Dynamic DNS provider. Our network is trusted to over 25 million users and billions of queries every day. No-IP has a robust Anycast Network with 100 points of presence located across the globe to ensure that your Managed DNS service never encounters any downtime. Guaranteed. Already have Dynamic DNS embedded in your product? In most cases adding No-IP will be as simple as copying your existing protocol & changing the update host server to ours. Let us show you! Basic Integrated Dynamic DNS is easy and lets you add our service quickly. Looking for a Premium integration? We offer customizable branded integrations. Contato an Integration Specialist today! Join the many Fortune 500 companies that offer No-IP as an integrated dynamic DNS solution. Integrating our DDNS is easy. Add No-IP as a free Dynamic DNS solution today! Call us or fill out the form and we will get back to you as soon as we can.